We guarantee the lowest prices allowed on all Osaki, Titan, and Apex Massage Chairs and the highest levels of Customer Service. The Dreamer PRO Massage Recliner is outfitted with the the latest in comfort technology. Let us ship and deliver your new Pro Dreamer Chair at no additional cost to you. That's right, you pay for your chair and we will deliver it for free. 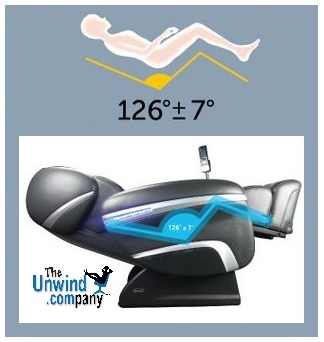 At Unwind, we specialize in Relaxation and Healthy Lifestyle products. We know that a Stress-Free Shopping experience assists you in your search for relaxation and comfort through Massage, aromatherapy, furniture, etc. We are dedicated to achieving 100% Customer Satisfaction at every opportunity. Drop us a line any time during normal business hours and ask us about "The Unwind Difference". The computerized body scan ensures that your unique spinal shape is taken into account before beginning a massage. Osaki knows that no 2 people are just alike. This means that no 2 people need exactly the same type of massage experience. This scan takes into account that you may carry your stress and tension in a lower back area or you may experience your discomfort in the cervical range of your spine. Pair this with adjustments to the intensity, strength, and speed of the massaging mechanisms ensures you will have a massage experience like no other. At the onset of each session, allow your chair 30-60 seconds to analyze the curvature of your back. You will be glad you did! The 3D Massage Technology allows the massagers to not only travel up and down your back and body but also outwards to penetrate the muscles. This type of pressure cannot be found in every massage chair. Osaki is proud to be on the cutting-edge of Massage Chair Science. To relieve the deepest of tension and sore spots, the massagers need to be able to knead into your muscles. However, you may be like most people and be glad there is an adjustment button for the intensity of the massaging mechanisms. 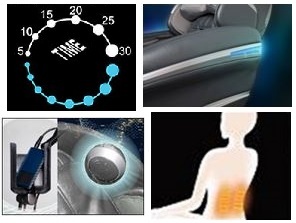 The Air Massage Function brings the latest in comfort technology to you. You can truly relax and unwind with this amazing feature. Multiple airbags strategically placed throughout the seat apply pressure and compression to your tired joints and most overworked body parts. Alternating rhythms, extended pressure, space-age upholstery coverings- all lend to an experience like no other. The waist and hip air bags serve to not only attend to and relax some of the largest muscles in your body but also to secure you into the seat to ensure the most accurate massage on your entire back. There are also air bags throughout the armrests and legrests. These stimulate those extremeties to ensure optimal bloodflow and muscular relaxation. Simply slide your arms and legs naturally into the pre-designed outlets. The airbags will react naturally during the course of the massage program or you can manually control them with the LCD remote. Take things a step further with 2 Stages of Zero Gravity Positioning. 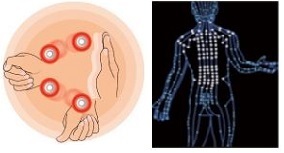 Your body not only needs massaging, pressure, and touch but also needs to be able to relax and adjust itself. Your body will naturally attempt to achieve an optimal state of homeostasis. Activate the Zero Gravity Positioning with the touch of a soft button. This will lean your seat back and raise your legs with a bend in the knee. This allows your body to rest more on the back cushion and relieves the pressure of gravity on your hips and legs. Press the Zero Gravity button once more and it will take you into 2nd Stage Zero Gravity Positioning. This leans you back further and raises your legs even higher. This posture is consistent with a body's naturally, comfortable pose within the womb before birth. You can often feel the impact of such relaxation within a matter of minutes. The allevation of weight pressure, the ease of blood flow to your extremeties, and much more become apparent within moments. 2nd Gen. S-Track Massage Function ensures you have the most effective and the most relaxing massage experience. The mechanisms are able to move and work along their track in a winding, almost serpentine pattern. Alternating focus on the muscles close and far from your spine helps to relax your entire back. This allows the appropriate amount of pressure to be applied near the spinal area without causing too much stimulation. The enhanced S-Track System allows for a truly therapeutic massage experience. The engineers at Osaki not only design the highest quality machines but also incredibly intelligent machines. Their massage chairs are pre-loaded with Accupoint Technology. designed to target and dissolve stress by focusing on key areas associated with bodily relaxation and key well-being points. There are multiple styles of massage theory that you can select to allow your PRO Dreamer massage chair to target your various accupoint areas. Osaki knows that we deserve to be treated with the highest levels of luxury and convenience. (That's also why we provide Free Shipping and Delivery.) Lower Back Heating Elements ensure that while your muscles are being vigorously stimulated and massaged, they are also being soothed with a truly therapeutic heat. Heat can release knots and tension by causing the local bloodflow to naturally increase and increasing elasticity. The level of heat is enough to soothe agitated nerve endings that contribute to chronic pain and other debilitating conditions. LED lights along the sides of the chair promote a soothing blue aqua environment. Turn the lights down and turn the LED feature on to enhance your massage with Chromotherapy. Relax and Unwind with your eyes closed or open; there is a feature for you. LCD Remote Control allows you to enjoy a plethora of pre-set programs or to manually adjust the chair to your comfort needs. There are 10 pre-set massage modes on this model. This allows you to sit back and relax and let the chair soothe your dull aches and pains or if you have a specific target of soreness, you can manually control the mechanisms for immediate relief. There are 3 different width settings and 5 different intensity settings. You can use this well-illuminated control to adapt your massage chair to your exact wants and needs. 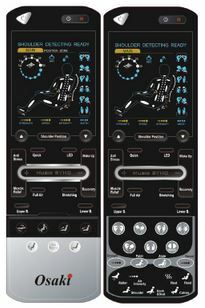 At the top of the handheld remote is a large LCD display that displays the actions of the massage chair, showing the time remaining, type of massage being applied, area of massage, intensity, speed, and much more. To access the manual controls simply flip open the lid at the bottom of the remote and select the massage type, intensty, speed and location. 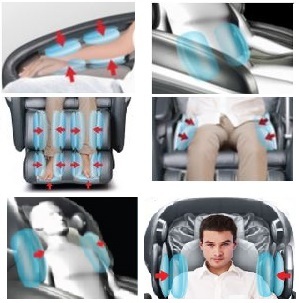 You can also select to independently massage select areas with the airbag compressional massage features. Shipping Dimensions: Height: 26" Width: 31" Depth: 51" - Please see card below for assembled dimensions for this product. When you are ready to order, simply drop us a line at 888-486-9463 or you can order online and our dedicated team of Customer Service Professionals will contact you by phone once the order is complete to verify the details with you.